It was after using up a couple of those sample cards of Fearless (I think they came with various Sephora orders) that I realized I had to have this blush. 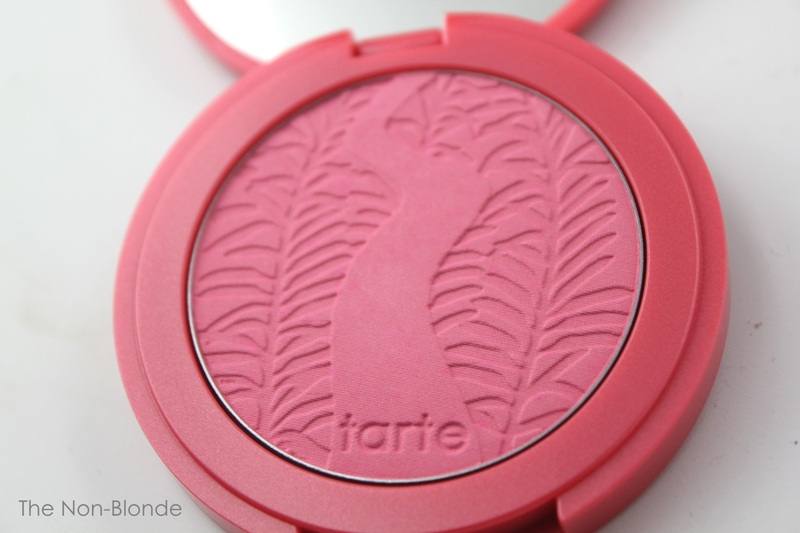 Tarte Amazonian Clay Blush in Fearless is a pink-leaning coral that is just bright enough without going all neon orange. I simply fell in love with the color, even though I never got what was the big deal about the Amazonian Clay products. It's a nice matte blush that goes on smoothly and is easy to blend. I can't say that there's anything in the texture or finish that is superior to equivalent makeup from other mid-range brands. While neither chalky nor powdery, the Amazonian Clay blushes are on the dry side, which you can see in the swatch (done over completely bare skin, no primer or moisturizer applied). But these are good products, they perform well (ignore that 12-hour silliness. Any decent blush stays on over a well-applied base), and as I said: it's all about the color. 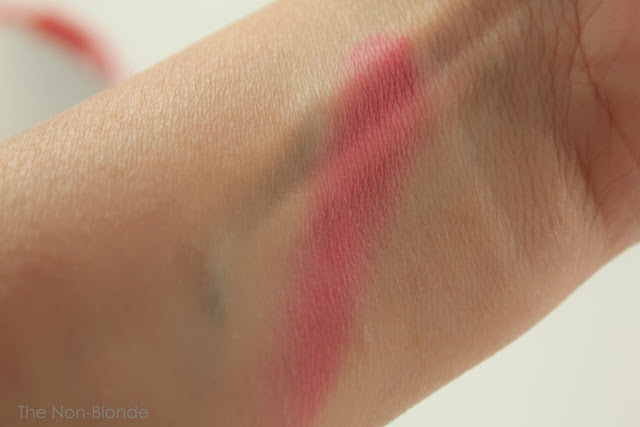 I apply it with my standard Hakuhodo 210 and make sure to blend well (it IS a bright blush). The result is pretty, summery, and just a joy to wear. I have to tell you that this blush lead the way to some additional Tarte purchases, lip colors in particular, because there's a Fearless lip gloss (currently lost in one of my purses), not to mention other adorable colors in various formulas. Ulta can be a very danger place when you're just looking for a hair mask. Bottom Line: I regret nothing. 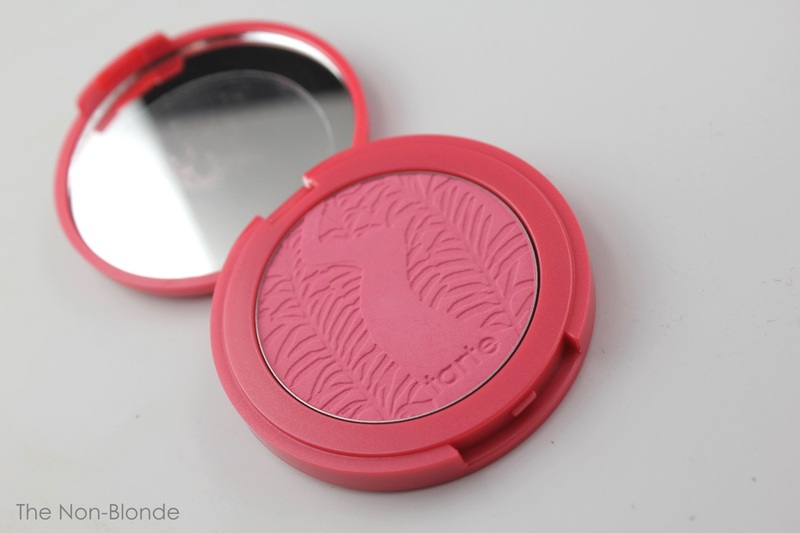 Tarte Fearless Amazonian Clay Blush ($28, made in the USA) is available from Ulta, Sephora, and tartecosmetics.com. Now that is such a pretty colour!